For quality industrial hydraulic hose reels, look no further than our vast selection of industrial hydraulic hose reels. We carry retractable hydraulic hose reels from top hydraulic hose reel manufacturer Reelcraft. Reelcraft hydraulic hose reels can handle low pressures, medium pressures, and high pressures. 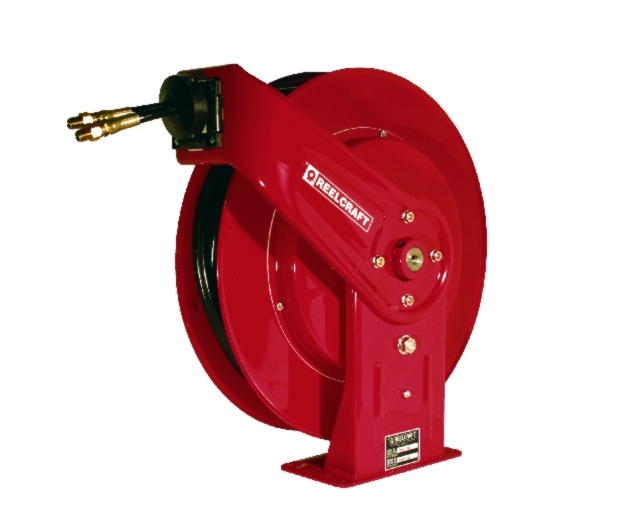 The hydraulic hose reels from Reelcraft are made from durable steel construction. Air Motor Driven Hydraulic Hose Reels are made for low pressure applications (1000 PSI). Spring Driven Twin Hydraulic Hose Reels are made for medium pressure applications (3000 PSI). Shop below for industrial hydraulic hose reel products from Standard Industrial & Automotive Equipment today!